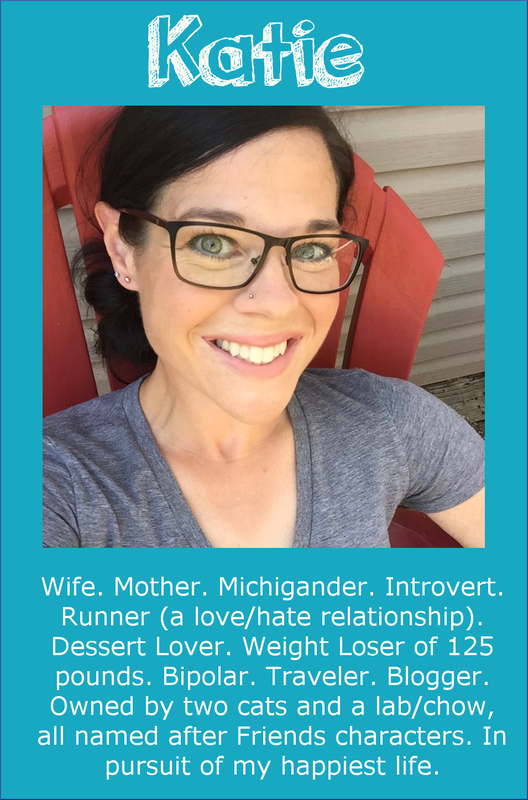 Runs for Cookies: What a small world! I did something today that I haven't done in a very long time... I ran intervals outside, on the roads. The treadmill makes intervals easier, because there is no thinking about it; just set the pace and run. The track is incredibly boring, so I've only done that a couple of times. The road is definitely most preferable because I don't get so bored, but it's HARD. I had been planning to do hill repeats on the treadmill today, but it was mentally torturing me, so I decided to set up my Garmin to do 8 x 400 with 200 meter recovery jogs. (Basically, that means that after a half-mile warm-up, I would run a quarter mile hard, then jog slowly for about 0.13 miles... and repeat for a total of 8 times. Finish with a half-mile cool down. I decided on an out-and-back route, because it's hard to make a lot of turns while trying to run really fast. I started with a half-mile jog, and then the Garmin started counting down beeps to my first hard interval. Since I hadn't done 400's outside in such a long time, I had no idea what kind of pace I was looking for. I guessed probably about 7:00-7:10/mi. The first one nearly killed me, and I saw my pace was 7:05. 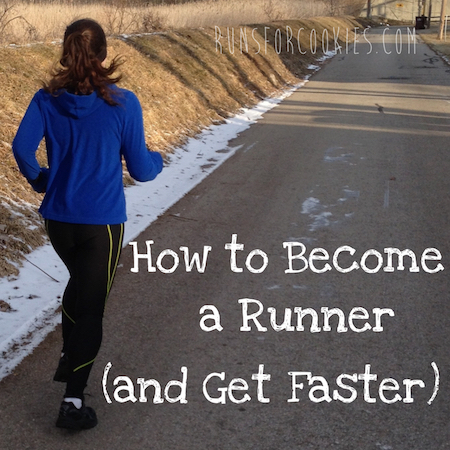 So, I knew that I was going to be getting much slower before the last repeat! I wished that I'd set up 400-meter recovery jogs, instead of 200-meter ones. I didn't even fully catch my breath between the hard intervals. 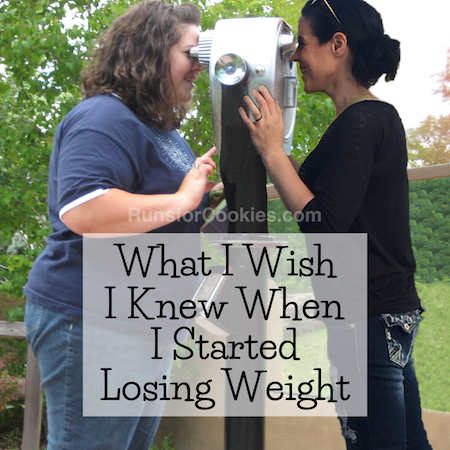 It was REALLY tough, and I wanted to quit so badly. But I finished, even though I could feel myself getting slower with each interval. 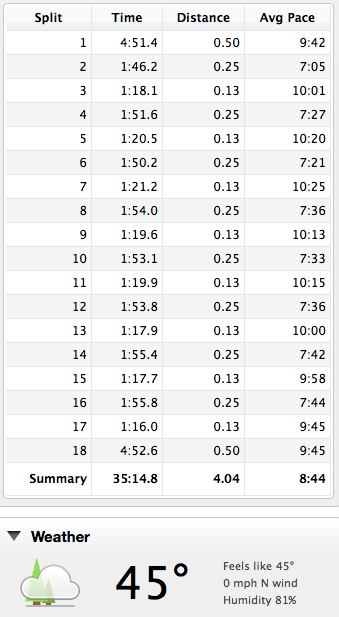 I was disappointed to see my pace, because I was sure that the last time I did intervals outside on the road, about a year ago, I was doing them with a pace in the high-6:00's or low-7:00's. I just looked it up on my blog, though, and today's wasn't too far off from last year! So I definitely feel better about today's run now, knowing I haven't gotten too much slower. This morning, I saw that a woman named Melissa posted a picture on my Facebook wall. 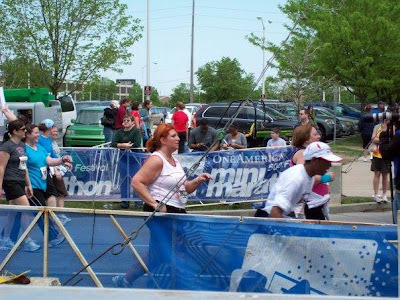 She said it was a photo of her finishing her very first half-marathon (in 2009). And, what a small, small world... look who was finishing right behind her!! Just in case you don't recognize that infamous blue shirt, it's ME :) Crazy, right?! I was walking next to my friend, Mandie (in the black shirt). Just in front of Melissa (partially blocked by the guy in the white hat) is my mom. 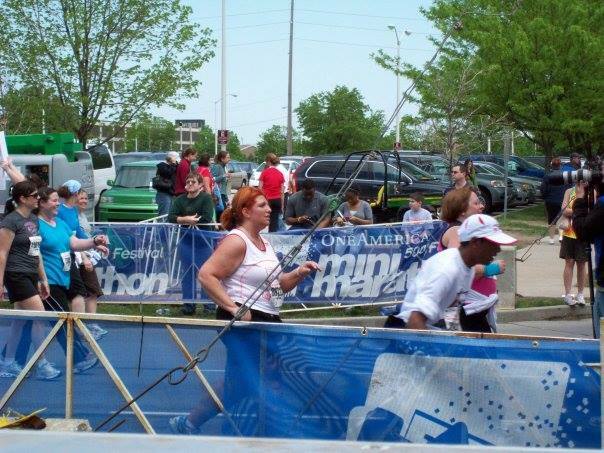 This was at the 500 Festival Mini-Marathon in 2009, where my "before" photo was taken. yes I was just thinking that. Maybe the people that know you in person recognize you but I've only known slim Katie and wow I can't believe that was you. You are so inspiring Katie each and everyday. 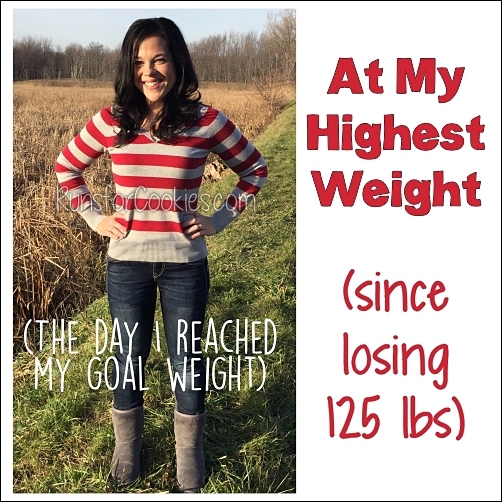 I love that you share all your struggles and I love that you don't judge people that are still fighting to lose weight. 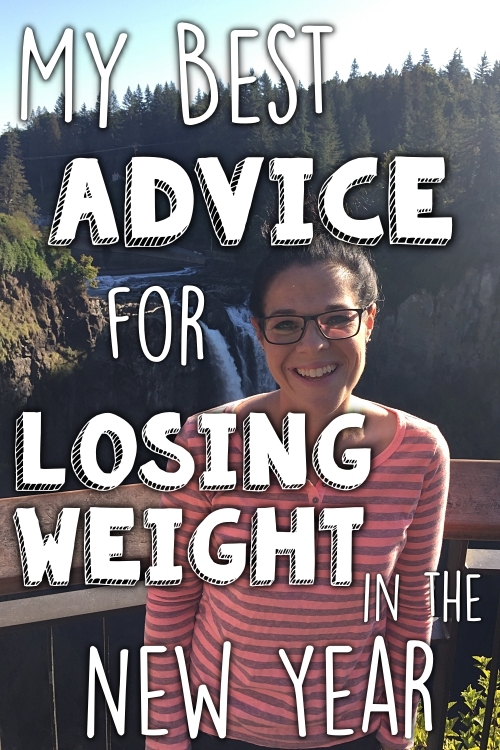 I have a lot of friends that have lost a lot of weight and they all became so nasty to overweight people. They feel disgusted. Maybe it's because they're scared to go back but they should understand the struggle and be more empathetic about it. Maybe they are already where they want to be and that is so great, but they should never judge the ones who aren't, they were once there, they once struggled and they once thought they could never do it. Great picture! I'd recognize that blue shirt and the pretty girl in it, anywhere!!! Great job on the intervals!! While I don't run nearly as fast as you, I do run regularly and am pretty impressed by those numbers!! Go you! Wow, how amazing that picture is!! Such a small world! Nice job on the intervals! 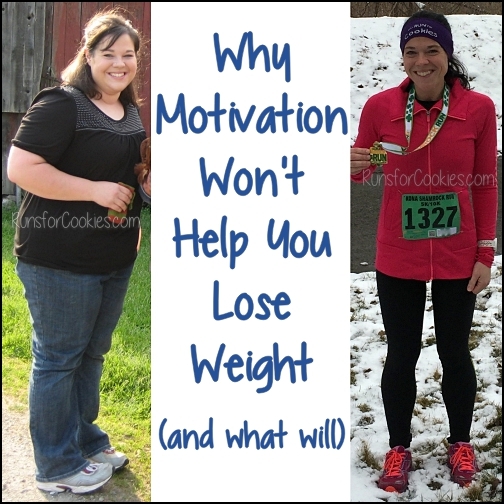 That is why I give myself 400 meter rests when I do the 400m intervals. 200 just wouldn't be enough. Way to power through it though! What a wonderful picture and a great reminder of how far you have come!! YAY!